A thinly populated human frontier surrounded by wilderlands. In ages past, this area was once a small part of a vast dwarf realm. While the dwarf realm is long gone, the bridges, cisterns and roads (including the Dawn Way) are still in use today. Tribal humans (Shentulka) moved into the area from the north and they were followed by other humans (the Nerathi) that began to build the first permanent structures since the dwarves. Over time, more Nerathi came out of the West and established the city of Rhest that grew into a wealthy kingdom (Rhestilor) that secured the roads all the way to Dennovar, creating a region ready for trade. Merchants began to trade with the civilisations south and east of Elsir Vale and it was something of a central safe haven and crossroads. Rhestilor was mostly a southern province of the Empire of Nerath to the north. Almost 200 years ago the Kingdom of Rhestilor collapsed under civil strife, monstrous incursions and magical blights. In the years since the kingdom's fall, most of the tribal humans (Shentulkans) returned to the north and the others left behind have come to look after themselves. Most of the local lords, such as Jarmaath of Brindol, still hold titles derived from the old kingdom of Rhestilor. While everybody knows that the kings of Rhestilor are long dead, no new realm has arisen in the vale. Recently, the vale was threatened by a horde of goblinoids and dragon spawn that swept out of the Wyrmsmoke Mountains. The Red Hand Horde was stopped at the walls of Brindol with the help of the adventuring party, The Watchers. Since then, the vale has settled back into a life of prosperity and expansion, but rumours are simmering that the symbol of the red hand has been appearing among the tribes again. The people of the Vale know not to be complacent. Talk has also turned to unifying the vale under one banner and returning it to a kingdom. A task that may be hard given the differing power groups that have risen to power in the years since the fall of Rhestilor. Elsir Vale lies in the subtropical latitudes. Summers are hot and dry (although punctuated by the occasional intense thunderstorm), and winters are warm and rainy. Large stretches of the area are quite arid, and the vale is flanked by vast savannas stretching for mile after dusty mile. The forests of the vale's northern boundaries are stifling and blisteringly hot in the summertime, with not a breath of wind to relieve the oppressive heat. Lake Rhestin's eastern shore is hard to define, because the lake gradually gives way to this vast wetland of reeds. Wet, grassy flats are home to many waterfowl and larger, isolated hummocks covered in dense brush and forest are where the wild elves known as the Tiri Kitor make their homes. Lizardfolk also dwell throughout the Blackfens. The western slopes of the Giantshield Mountains are known locally as the Blanrydes. These limestone hills are fairly barren, but contain copper and lead deposits, so are dotted with old mines. The Carmen Mines are still worked by a mining collective. An old underground channel, called The Slug, was excavated by miners to drain water from mines into the Whitecross River to the south. Leakage of heavily tainted ore makes the grass above yellow and rank. Food is scarce here, except for the eel of the Eelhold (see Oldscutt River). One of the largest settlements in the vale, Brindol is a prosperous farming community and caravan stopover located along the Dawn Way on the south bank of the Elsir River. Orchards of apple and pear trees follow the river's winding shores, while broad grain fields and farmlands surround the town for miles in all directions. Brindol is the home of Lord Kerden Jarmaath. His small keep and the city walls are the only fortification of note this side of Dennovar. Lord Jarmaath is preparing his daughter, Kaylee, for ruler-ship, as age is catching up with the lord. This large ravine is riddled with caves (really mines) tunneled by the endless humanoid tribes that have been drawn to the valley throughout the ages. 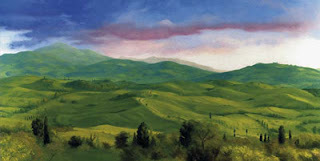 The valley lies where the Westdeep forest creeps into the hills of the Wyrmsoke Mountains. Legend says that part of Gruumsh's eye fell to ground here when Corellan struck it out during the Dawn War. Many sages think it is instead the home of a Spirit Stone for the verdant Westdeep. In any case, the ravine has been occupied by all types of humanoids and they often remain a constant threat, raiding the caravans travelling to the West. A sleepy little hamlet, home to about 200 people, nestled on the western edge of the Lyrchwood, between the Hammerfist Holds and Brindol. A trade city located on the shores of Lake Ern and the eastern gateway to the vale. 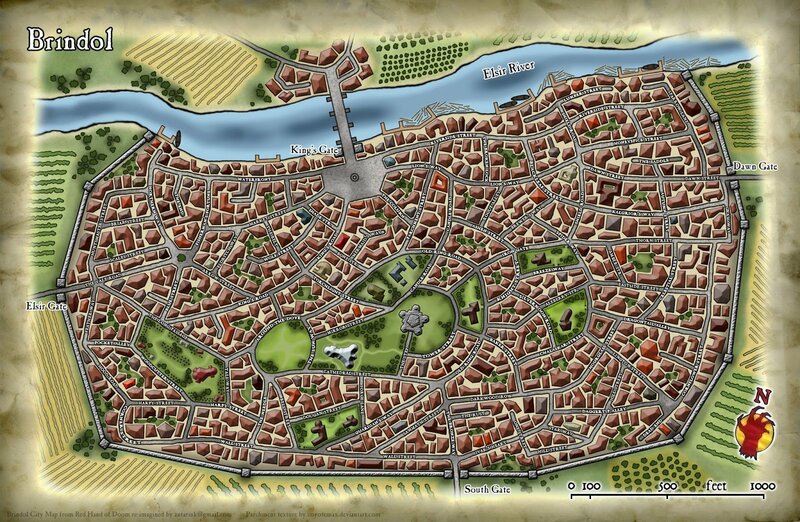 It is the largest city in the vale and ruled by Lady Yisel Bristier, but the Merchant Council has the biggest say. The city is also noteworthy for its many temples. The western gateway to the Vale where a dwarf bridge once stood, but is now replaced by a large, horse-drawn ferry. A splitting of the Dawn Way that climbs through the Wyrmsmoke Mountains. Rarely for a number of years, due to large numbers of goblinoids in the mountains, traffic is increasing as efforts have been made to build garrisons along the road since the Red Horde war. One of the heroes of that war, the minotaur Brahmus, personally took charge of one of the old ruined keeps along the road and his working to secure the safety of this important thoroughfare. A broad but slow-moving river that cuts through the Vale. It is fed by several tributaries and averages 200-400 yards width. It can be forded at Elsircross, a wooden bridge spans it at Brindol and there are ferries at Talar and Drellin's Ferry. The river's depths cannot be seen in the fast-flowing green water, but it is known to be deep. Great eddies swirl in larger parts of the river and small islands often form only to disappear a week later. This town, located at a ford over the Elsir River, is known for woodcutting and papermaking. The old town is surrounded by a decrepit palisade but the town has expanded well beyond these walls. During the Rad Hand Invasion Elsircross actually benefited by the increased traffic heading this way. A large inn has been built right next to the rivier crossing. 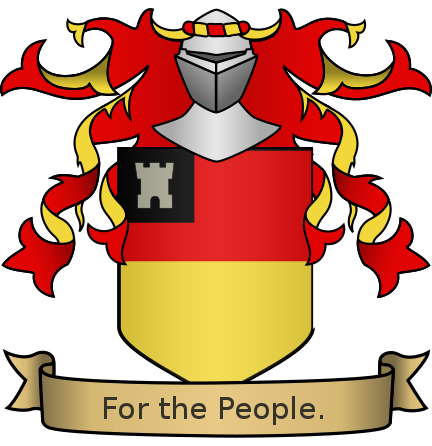 The self-styled (and none-too popular) 'Baron' Hargil Trask and his clan govern here. The family recently annexed Red Rock and Marthton too. Sheltering Elisir Vale from the harsh weather of the Endless Plains, the Giantshields are a low range of arid, well-weathered peaks. The northern slopes are barren, dry, and rocky; home to a variety of monsters. The southern slopes are a little more hospitable, covered in light pine forest and cut by the gorges of many small, seasonal streams. In the foothills of the Wyvernwatch Mountains, these communities of dwarves eek out a living, mining iron and silver. They are rather insular but sometimes trade with the humans of the Vale. Strangely, halflings are more welcome here as a bond has formed with the short folk. Perhaps it is the wares and stories they bring from The West that the dwarves love. Primarily populated by shepherds and cattleherds, few visit this dusty flyspeck in the northern Brown Hills. An old Nerathi keep/outpost located several days west of Drellins Ferry. This used to mark the western boundaries of the old Nerath Province of Rhest, but is now a ruin and serves as a stop over for caravans heading to the West (when not occupied by local humanoids). This shallow, marshy lake stretches almost 100 miles from north to south. Once its shores were dotted with the villages and manors of Rhestilor, but they now lie sunken and abandoned (except for the many lizardfolk that have taken up residence in them). A small wood that yields the best quality (lyrch) wood of the area and is heavily logged. The woods have no known evils other than the odd goblin tribe. Currently, a wild pack of dogs known to attack the lumberjacks is the only concern. Climbing the southern foothills of the Giantshield Mountains, Marth Forest is a rugged, wild woodland rarely trodden by human feet except in its southwestern fringes. There is an air of foreboding mystery surrounding the Marth Forest. Those that venture there have described it as if the trees themselves are watching. Strange creatures with tentacles, large dark eyes and rubbery skin have been described. Many believe the forest has caverns that lead to the Underdark, whilst others believe if has connections to some alien plane. Humans and ratlings left the forest en-mass around a century ago. Located in the shadow of the Marth Forest, this town thrives on woodcutting and catering to travelers on the Dawn Way. 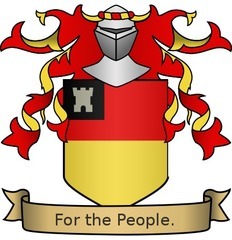 Baron Trask, of Elsircross, assumed control of Marthton three years ago after the old lord passed away with no direct heir. This was good farm land until it started to become waterlogged in mid 726 N.Y, making this bog a very new feature of the Vale. The cause of this watterlogging is a mystery. The most likely reason is an underground waterway in the Blanryde Hills has burst its walls and now flows out into the lowlands, but no one has found such a source for the water. This tiny settlement grew up around a large walled inn known as The Cross-Eyed Beholder. The town has several orchards and goatherds keep their livestock in the nearby heights of the Nimon Hills. This slow-running river winds its way down from the Blanryde Hills and the western Giantshield Mountains into the Witchwood where it meets the Witchstream. An old, but recently restored, wooden bridge spans the river where it intersects the Rhest Trail. The Olscutt used to be a fast flowing river, but was dammed at the Eelhold.The Eelhold is a log dam, built some 50 years ago. The dam is protected by fey and the eel in the dam are only made available once per year when people can come and catch all they like. The Patchwork Hills lie south of the towns of Nimon Gap and Terrelton. They get their name because their appearance in the fall is mottled and patchy, not unlike a regular patchwork quilt. Heather and bracken cover the hillsides and grazing is poor. The Terraces were carved into the northern escarpment as far back as the dying years of the realm of Rhestilor. The terraces are cut with steps in the rock, winding up to each level. The soil is surprisingly good here. Ownership of a terrace is a highly valued piece of land. The southern hills are very rocky. The New Mire has recently appeared and spread to the southwest of the hills. A quiet little place most noted as being the home to the retired adventuring band The Six Blades. Rich copper veins in the high foothills of the Giantshield Mountains gave rise to the rough-and-tumble mining town of Red Rock. The Trask noble family rule here after a 'take-over' of the mining guild in 727 N.F. This small wood on the river between Brindol and Elsircross takes its name from the many fruit trees and berry bushes which make the wood a riot of blossoms in springtime. The Redwood is communal land as far as fruit-picking goes, but the Trask noble family refuse to give anyone foresting rights or to let anyone settle here. Once a prosperous city and center of the kingdom of Rhestilor, Rhest is now a half-drowned ruin, slowly sinking into the Blackfens. Governed by Lady Celiira Nestern, noted for her high-spirited approach to life and leadership. A dusty town in the western part of the vale that gets by on livestock and leather trades. 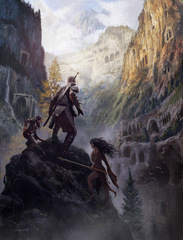 A name given to the trail to The West that passes between the Wyrmsmoke Mountains and the Thornwaste, following the Elsir River out of the Vale. It was named this because it became the safer, but rougher, route when large amounts of goblinoids were raiding along the Dwarfroad. The Elsir River protects caravans from the goblin raiders, but orc bandits from the Thornwastes sometimes cause problems - though most merchants have learnt to bring something to trade with the orcs. Located at the ford of the Witchstream, this settlement is governed by a council of elders (as several of the tribal folk settled here). They maintain close relations with the local druid circle. Humans make up the majority of the population of the Vale. Most are Nerathan (pale-skinned with light eyes and hair). Many, however show signs of the tribal Shentulka that once settled here (or remain in scattered tribes in the surrounding wilderness). The tribal folk have coppery skin tones, tall builds with straight, dark hair and dark eyes. Dwarves live in numbers in the Giantshield and Wyvernwatch mountains where they work as miners and smiths. They trade with and travel regularly to the human settlements of Elsir. Many live in the larger towns and are mostly integrated into life in the Vale. In fact, many of these settlements are built upon old dwarven outposts or way-stations built along the road they constructed before the Nerathans arrived. Elves dwell in the wilds of the Witchwood, the Blackfens and the Thornwaste. They consider themselves autonomous to the boundaries of the Vale's small realms but are not hostile to its people. The elves in this region are often referred to as 'wild elves' as they live solely off the land in much the same manner as the Shentulka that were once common throughout the area. As they have little contact with the humans of the Vale, half-elves are rare, but possible. 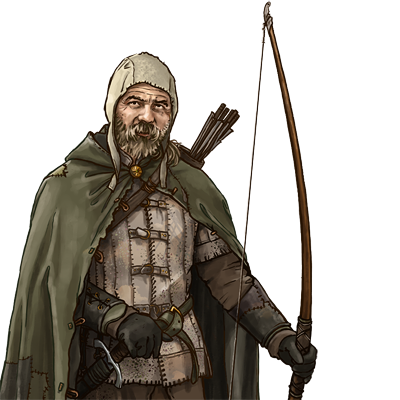 The Shentulka are the most likely humans to mix with elves. Halfling families pay tariffs to ply their trade upon the rivers of the Vale and beyond. The people of the Vale tolerate the halflings' mischievous ways for the entertainment and foreign goods they bring to the towns. Over the years, many halflings have also settled the fertile lands of the Vale and each of the larger settlements along the river has a permanent population of halflings too. Once inhabitants of the wilds of the northeastern vale, nezumi (ratlings) have now become part of human society in the settlements around the Marth Forest where they once made their home. No one is sure why they left en-masse, around 100 years ago, but they have since found a niche in society, often performing menial tasks or serving as shepherds, scouts and hunters. The ratlings have mostly forgotten their old way of life and only a few tribal elders cling to the past. Most modern ratlings have fully assimilated. Lizardfolk dwell in isolated pockets, and in numbers in the Blackfens. In most cases, arrangements have been made between the tribes and local authorities to keep the peace. In some places, lizardfolk and the people of the Vale openly trade and offer each other assistance. The most common enemies to the civilised people of the Vale are by far the goblinoid races (goblins, hobgoblins and bugbears). Isolated tribes exist in most wilderness areas, even small woods close to towns. They are often the local bandits. The Wyrmsmoke Mountains are however, the traditional homeland of these people, and given the lack of traffic on the western roads and numerous reports from the people of the west end of the Vale, the goblinoid numbers are again on the rise in these mountains. They have united in a grand army before and marched out of the Wyrmsmokes and fears are they are joining together to do so again. Isolated tribes/clans of ogres and giants also cause havoc from time to time around the vale, but these people are generally too small in number and refrain from drawing attention to themselves. They are not above raiding isolated camps and livestock however, and most humans would celebrate the destruction of an ogre or giant clan. The thieves' guild of Brindol and beyond. Have a well organised core of pickpockets and experienced burglars, but also gangs of highwaymen and cutthroats. Once one of the two noble houses with the prospects of uniting the Vale, this house has increasingly lost power to the rising Merchants Council. Based in Dennovar this house oversees the Vale's largest city. The current ruler, Lady Yisel Bristier, seems content with the situation - a situation that has dated back at least four generations. She is still the nominal ruler, but all decisions are verified by the Merchants Council before being ratified. House Bristier has an average number of soldiers and bonded knights and deploys these mostly to protect their lands and holdings. The Dennovar Blades are the official guards, city watch and army of Dennovar. The two groups co-operate when they must. They are not considered rivals, but nor are they close allies. An organisation of sages throughout the vale, but mostly represented in Dennovar and Brindol, that seek to share their knowledge and keep this knowledge alive. The standing army of Dennovar that also act as city watch. 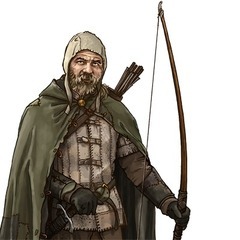 They are funded by and therefore answer to the Merchants' Council, so a lot of their duties are also guarding caravans and making sure the road remains free of bandits. Several shifter scouts are employed in the Blades. An elite, dwarven fighting force of the Hammerfist Holds under the direct command of clanlord Othrek Hammerfist. A unit of these also fought in the Battle of Brindol and the two realms have maintained friendly relations since. Elven tribe that spends most of its time in the Witchwood. Probably the most influential noble family in the vale. The Jarmaaths claim to trace their titles back to the Kingdom of Rhestilor. 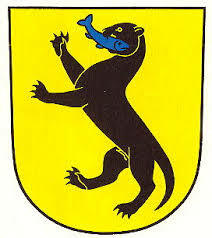 The Jarmaaths are based in Brindol and the surrounding small towns pledge allegiance to the family. The family has grown very wealthy and has a tight leash over Brindol and beyond. Their military (The Lion Guard) serves as the city watch, regional law enforcers, house guards and front-line forces as needed. Lord Kerden Jarmaath looks older than his 45 years of age. He led the people through the Battle of Brindol and was a strong supporter of The Watchers that helped during the battle. (He even helped Rocc established his own guild hall during the years of restoration following the battle). Although much revered, Kerden has grown weary of rulership and has been preparing his daughter Kaylee for his position. This handover is not likely to go well, for although Kaylee is very lawfully minded, she has already shown glimpses of being fond of power. The circle of druids based in the Witchwood. The community of Witchcross used to consult regularly with the druids, but following the death of druid Speaker, Adranna the Young, four years ago, the council lost ties with the circle. A very powerful and influential merchant house based primarily in Brindol, but with influence across the Vale. Although their stocks took a hit during the Battle of Brindol and with the recent death of the house head, Lady Verrasa Kaal, the house has been able to maintain a strong presence. It was rumoured that more than half of Brindol owed Lady Verassa money and/or favours. Many wonder whether the new leader (Verrasa's niece) Desislava will come looking for those debts. Desislava is shaping to be even more ruthless than her aunt. House Kaal fields a military of around 70 warriors/guards. Most operate as guards for the house's residences, warehouses and caravans. A core group form Deisislava's elite guard. This the military of the Jarmaath noble house. They garrison the keep, patrol the lands around Brindol and serve as the core of the city watch. As such, they have a lot of influence. Their banner of a white lion head on blue is in recognition of the lion symbol of ancient Rhestilor. The most skilled and experienced members of the Lion Guard are awarded the title of Lion of Brindol. Currently, there are 20 serving Lions of Brindol. A powerful oligarchy concerned with keeping the city of Dennovar a good place to do business. In essence, their influence is much wider than Dennovar. Many merchant companies join the council for security. House Kaal is one major exception and the two have had many disputes when it comes to trade in the western half of the vale. A small house based in Talar that has long been beholden to the larger Jamaath House of Brindol. In the ten years under the rulership of Lady Celiira Nesten, the community has had to rebuild following the Red Hand invasion. Lady Celiira helped fight off the invaders from Brindol and following that was granted independence from Brindol. After rebuilding Talar, she removed the conservative town council, whose members had been accustomed to running things during her old father's reign. Whilst many of the elderly do not like her impulsive ways, many of her decisions have paid off and the younger generation look to their leader with admiration. Dennovar, being a much more pious place than Brindol, is the seat for this council. The seated council is made up from the highest-ranking priests of the major temples of Dennovar (or beyond). Caretakers of the Blackfens, where they patrol on the backs of giant owls. The Tiri Kitor came to the aid of Brindol when it fought the Red Hand and Huntmaster Killiar Arrowswift formed a strong friendship with The Watchers and Lord Jamaath. To this day, the elves of this tribe have a home in the city of Brindol and several travel between their march homeland and the city on the backs of giant owls. The ruler of this house has styled himself 'baron'. The venerable Baron Hargil Trask claims ancestry from a line of lords known as the Parlfrays who supposedly had a keep in the Marth Forest. Few other noble houses acknowledge this title, but they have not openly opposed the Trasks. Conflict is likely though, as Trask recently took over the rulership of Marthton when its ancient ruler, Lord Erethal Rethrew, passed away without a direct heir. The Trasks then took Red Rock under their wing too - a move that will bolster their coffers. There were no titled rulers of Red Rock; the Trasks simply took control of the mining guild there. Baron Trask rules from his keep around 6 miles north of Elsircross. It is still referred to as Parlfray Keep. Despite being a smaller house, the Trasks are very militaristic. They have a large number of soldiers that patrol their lands and are working hard to bolster the militias of the towns under their control. The soldiers and knights of House Trask are fine swordsmen that fight without shields and are easily recognised in their cloaks and tabbards of yellow and black. This was originally the name of the small adventuring group that helped save Brindol during the Red Horde Invasion. They sabotaged the horde's move across the vale, organised alliances (such as with the Tiri-Kitor elves) and then helped lead the defense of Brindol. In the years after the battle, Rocc (the gnome warden who was almost crippled in the final battle) obtained an old shop and a smithy. He invited one of the first friends he made in Elsir, the dwarf Kulkin Stonedelve of Red Rock, to come to Brindol and work the forge. In time (and with money from Lord Jamaath), Rocc and Kulkin set up an adventurers' guild. Rocc wanted to train up the next Watchers, but also wished for there to be a lot more of them. The Watchers' goals are simple: fight evil wherever it rears its head and make life safe for the people of all Elsir Vale. They do not seek fortune, though in time it is likely people will be very willing to pay for their services.